Museum Gift Shop on pages 6a, 6b, 6c, 6d & 6e. 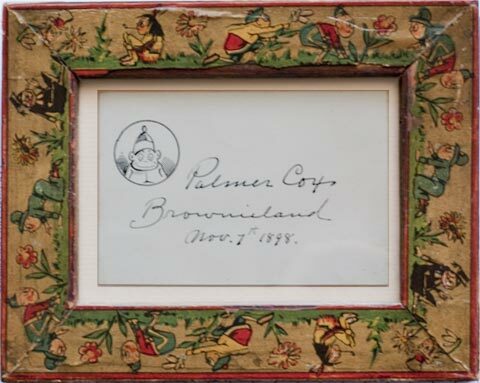 One of my favorites - A paper on wood Palmer Cox frame from the 1890s with an autographed card signed by Palmer Cox. It is 3 1/2 x 5" od. 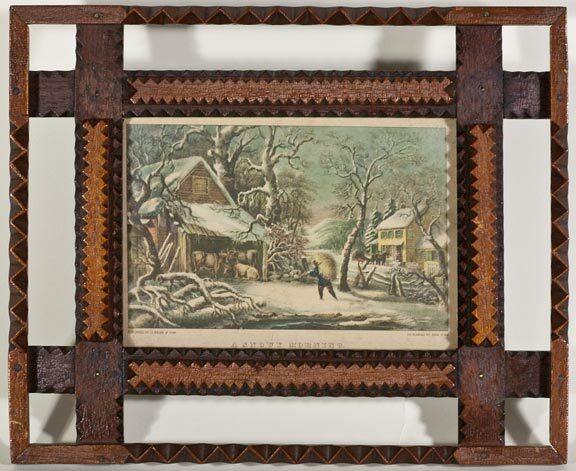 One of the best folk art frames from the 1880s-1890s. It is made of pine, oak, walnut, and mahogany and once had wood stars at each corner. It is 12 1/2 x 14 1/2" od. 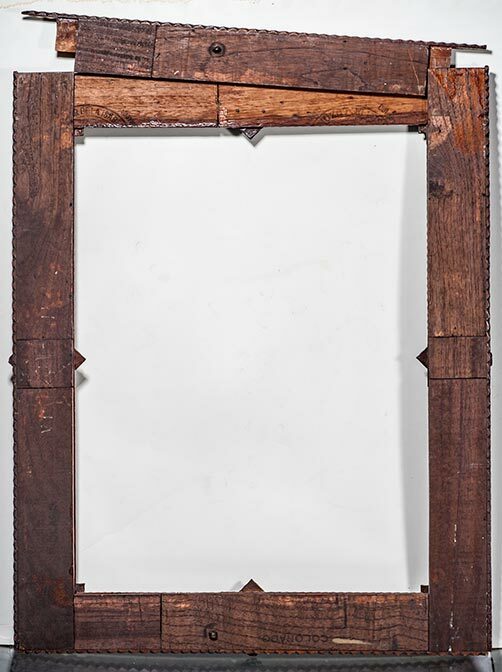 Another great folk art piece of oak and mahogany from the 1880s-1890s. It is 10 1/2 x 12 1/2" od. 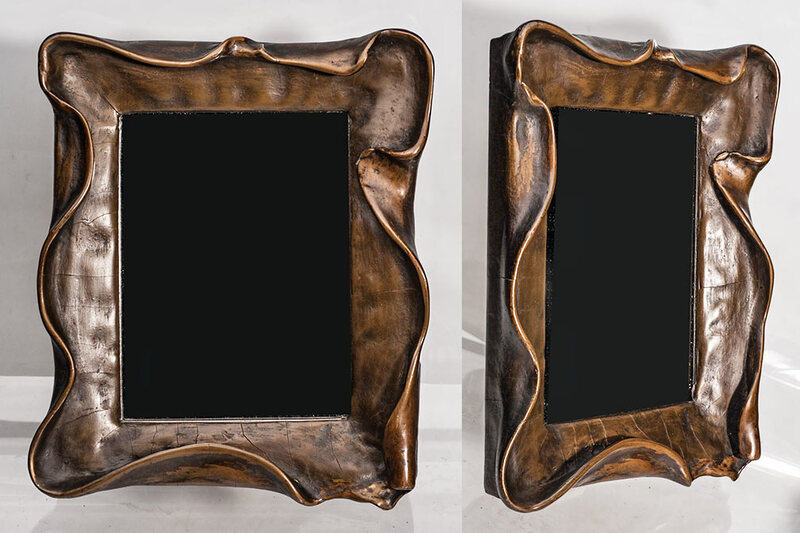 Freeform pie crust nouveau gessoed wood frame ca.1895-1910. No repairs. It is 16 1/2 x 19 1/2 inches od. and has a 6 x 8 inches pic. size. 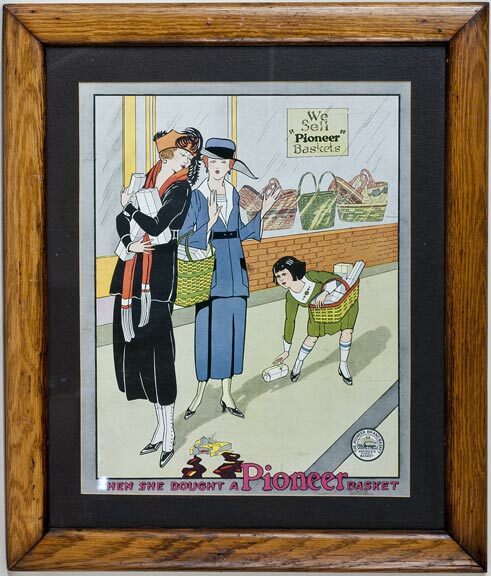 A wonderful folk art frame from the 1890s in the style of Tramp Art. 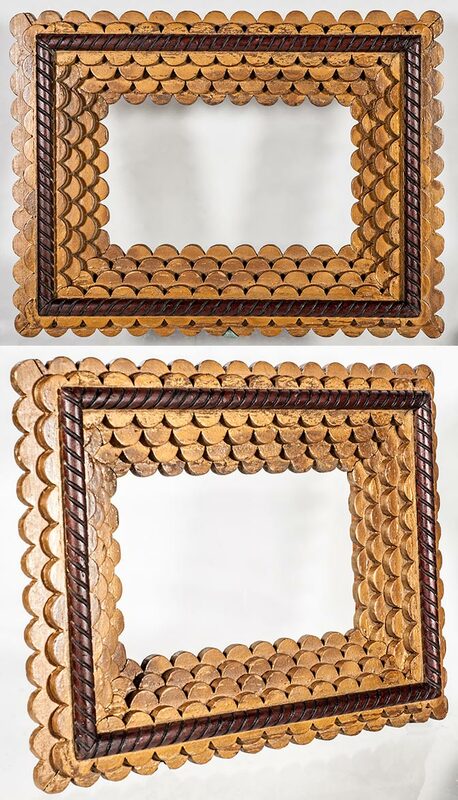 It is made of gold painted semi-circles with a walnut, front piece. It is 10 x 13 1/2" od. 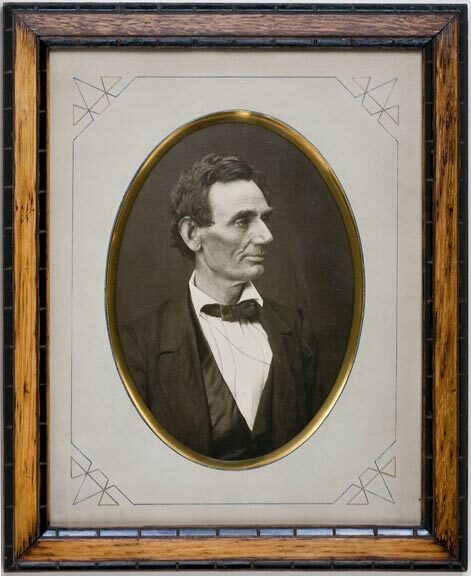 with a 5 1/4 x 8 1/2" image size. 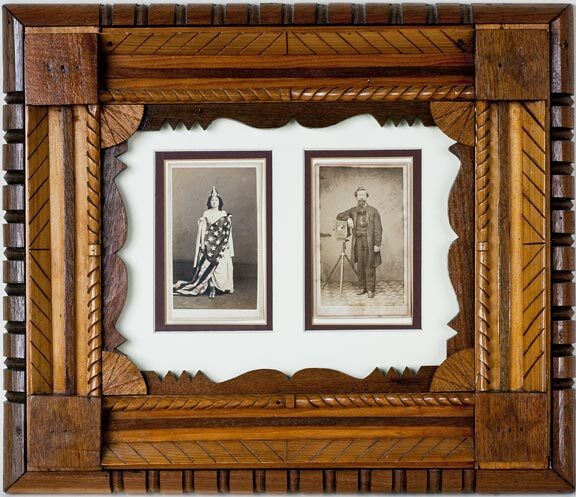 A beautiful tramp art frame with an unusual loading system, ca.1890s. 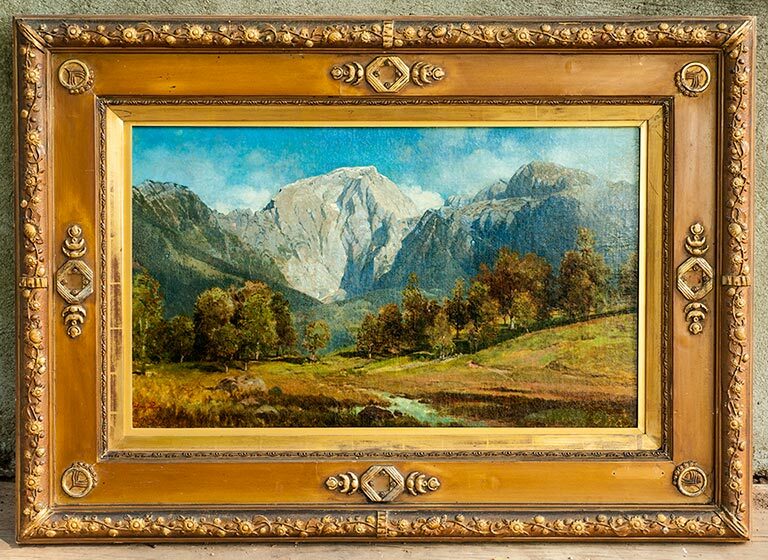 It has a European style (although the markings on the back are stamped "Colorado"). It is highly unusual to see a tramp artist combine subtractive chip carving work with the traditional tramp art notching and layering. 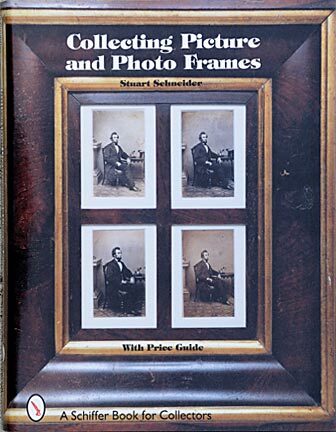 One edge of the frame slides out and you would slide in a picture and glass or a mirror and then replace the side. It is 21 3/4 x 25 inches od. with an 16 3/4 x 21 3/4 inches pic. size. 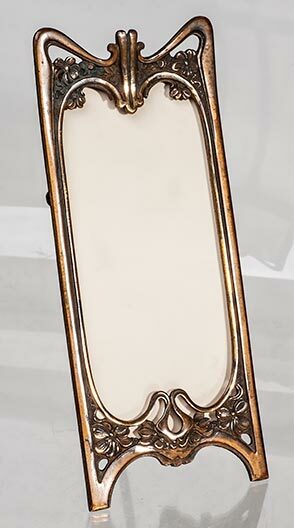 An Art Nouveau aesthetic piece, ca.1885, with stylized florate design. The aesthetic design movement was an intellectual and art movement supporting the emphasis of aesthetic values more than social-political themes for fine art. 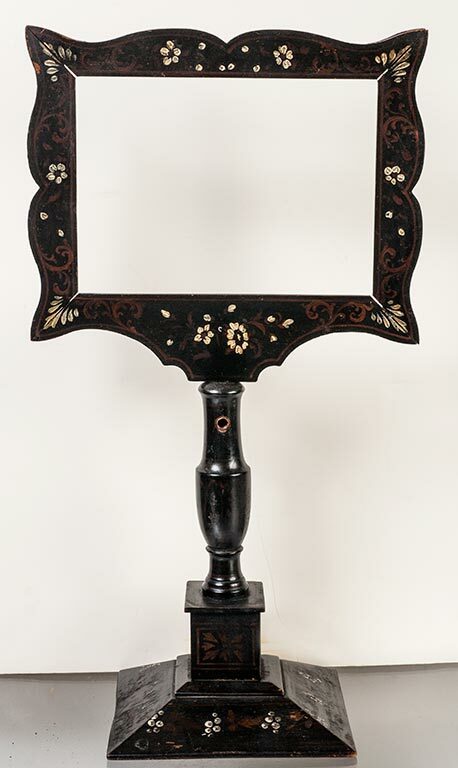 There was a prominent use of nature, especially flowers, birds, ginkgo leaves, and peacock feathers. It is 10 x 11 1/2 inches od. with a 7 3/8 x 8 7/8 inches image size. 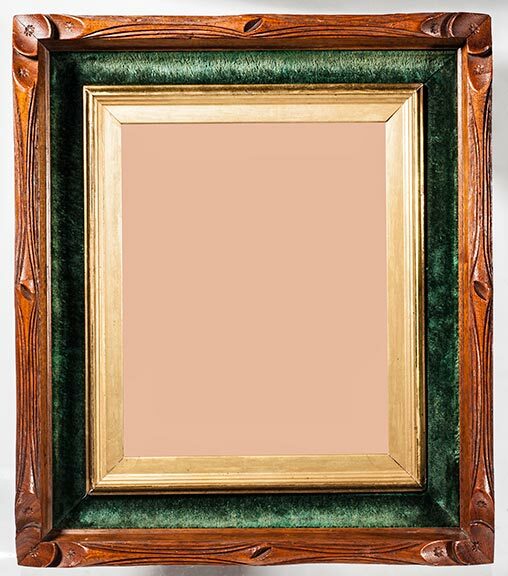 Victorian, rustic branch-carved walnut with green velvet cove, gilded inner frame, & hearts at corners. It is 13 1/2 x 15 1/2" o.d. and has a 8 x 10" picture size. 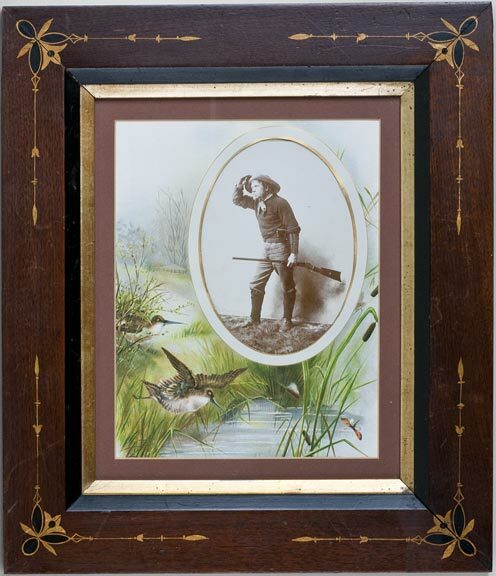 Often, the velvet in Victorian frames is disintegrating, but this example is in superb condition. 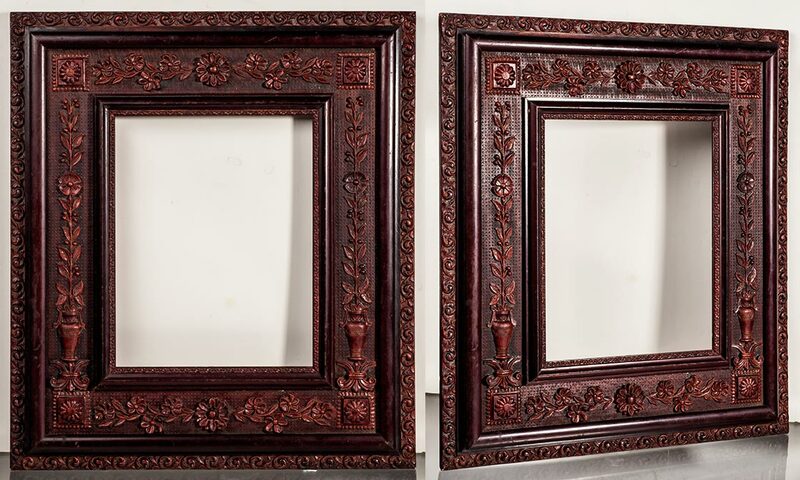 Carved hearts are a real plus when valuing old frames. 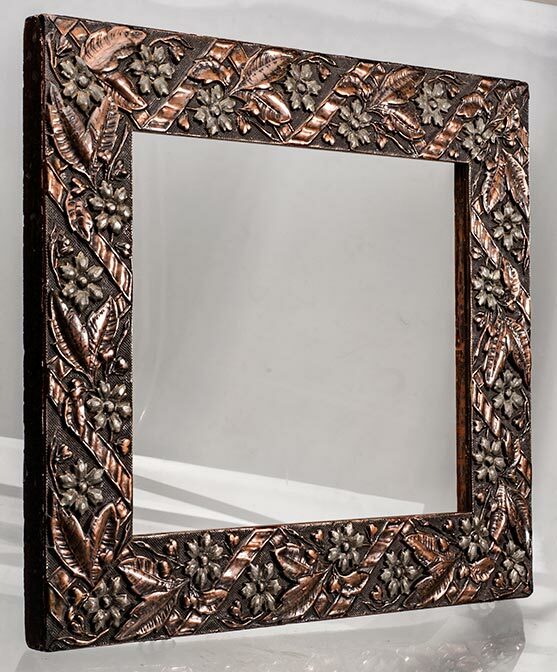 An 1880s elegant oak with beads piece. It is 12 1/2 x 14 3/4" od. Simple oak from the 1880s-1900s. 17 x 20" od. 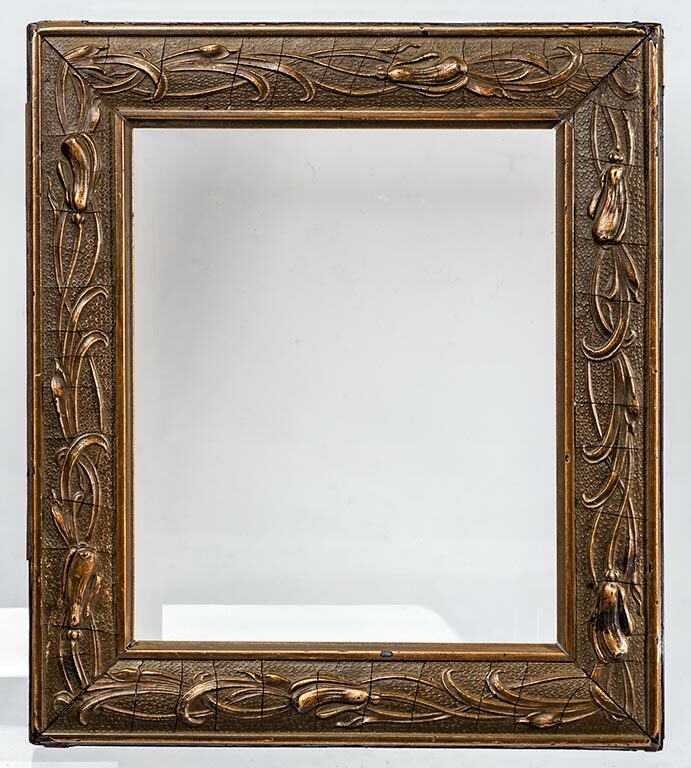 Simple walnut with applied decorative corners from the 1880s. It is 12 1/4 x 14 1/4" od. Simple oak from the 1880s. 9 1/2 x 11 1/2" od. 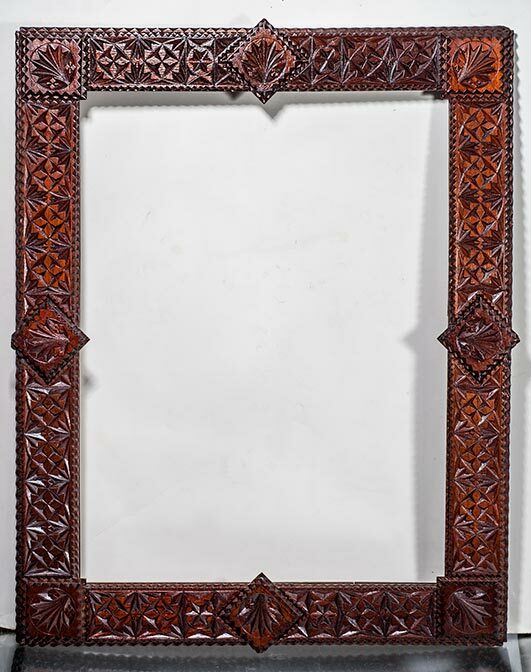 An 1890-1910, very unusual, highly detailed, thermoplastic/resin (similar to gutta percha), raised design, reddish frame with reddish wood trim. This is the first of this type that I have found. It is 15 3/4 x 17 1/2 inches od. 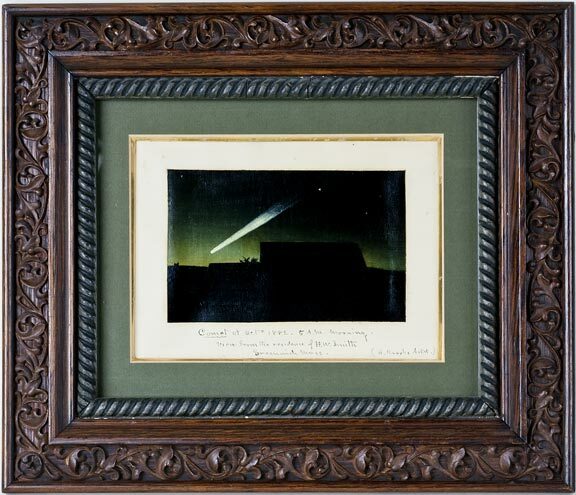 and has a 8 x 10 inches image size (rabbet). 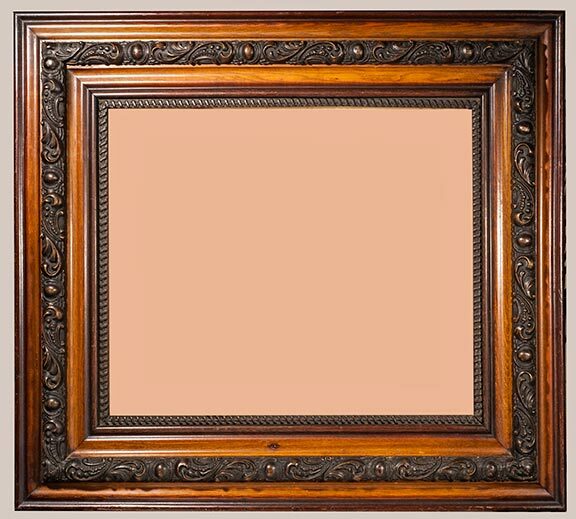 An attractive, larger, oak frame w/brown, raised gesso work in center-area. It is from the 1890s. It is 28 1/2 x 32 1/2" od, inside 18 x 22". 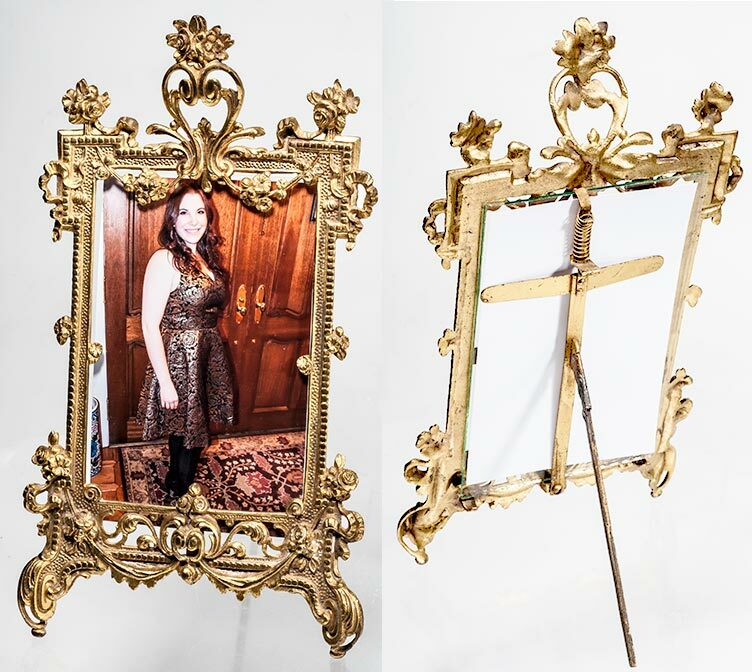 A great Victorian gilded piece (copper, gold, & bronze) with disparate designs. Very often these Victorians are missing chunks of the gesso decoration. Made in the 1880s. 13 x 15" od. with an 8 x 10 image size. 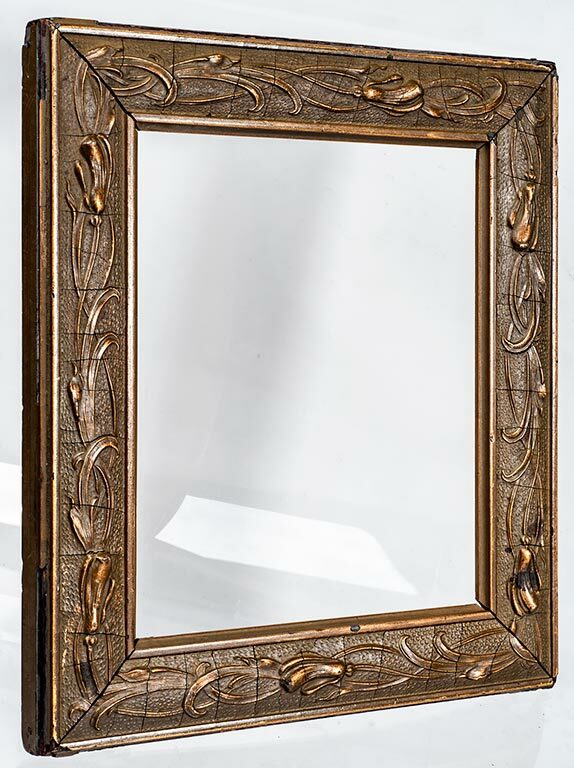 ca.1890, Victorian era with oak grain, gesso inner border. 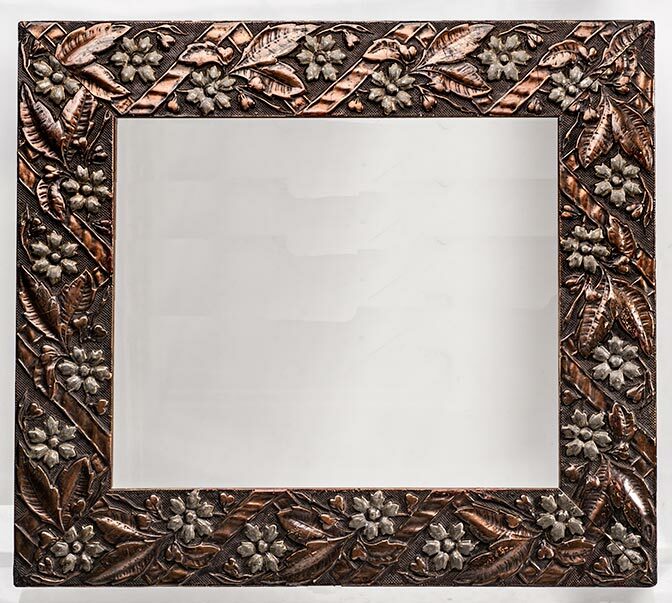 It is 15 x 19 7/8", inside 11 x 16"
ca.1890, Oak w/leaf design in gesso on outer edge, rope design on sight. 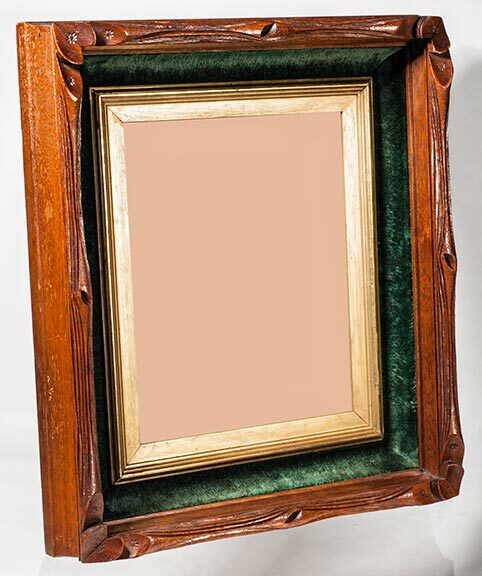 12 1/4 x 14 1/4", inside 8 x 10"
A very large, elegant bronze and gold frame with a Julius Rose mountain painting. Made in the 1880s-1890s. It is 31 3/4 x 44" outside and holds a 20 x 32 1/4" painting. 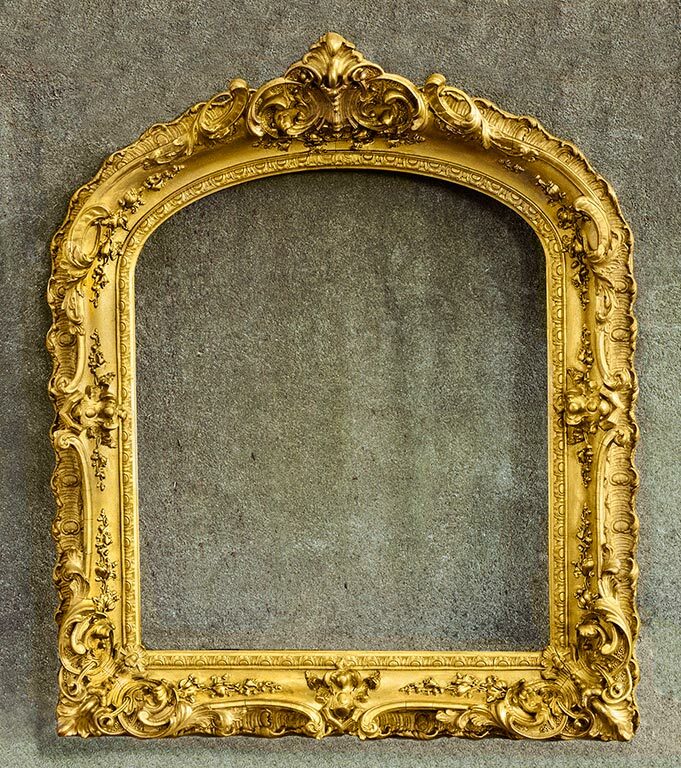 Large, elegant gold arched top frame. Made in the 1880s-1890s. It is 35 x 42" and the painting size is 25 x 29 1/2" & is about 5" from front to back. 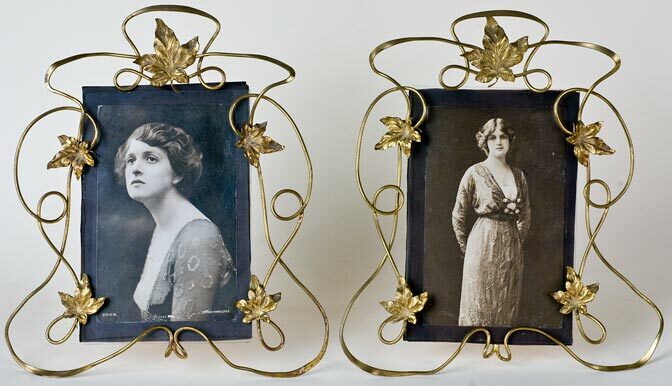 Brass photo frames made with flattened wire & metal leaves in an Art Nouveau style. Made in the 1880s-1890s. 7 x 10" od. 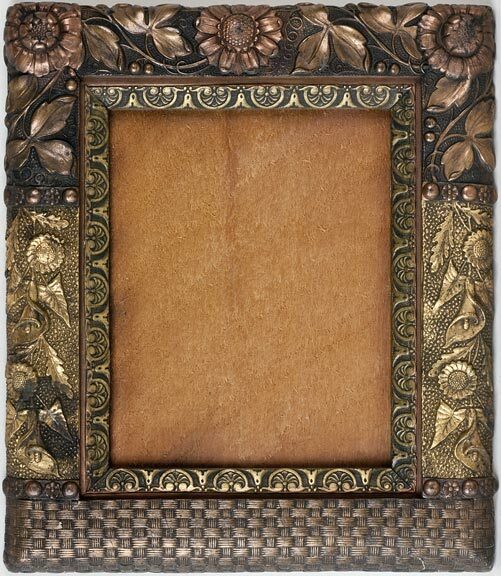 A wonderful ca.1894 brass table top Art Nouveau frame. 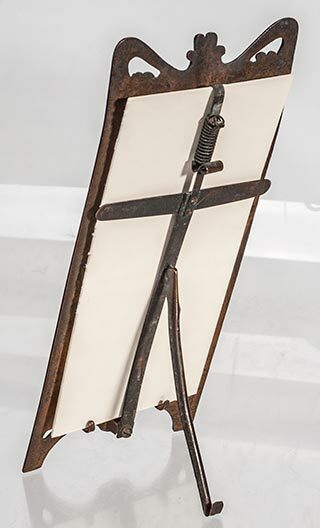 It has a G. Scheurich's Patented Photo Stand, (Jan.18, 1881 Patent) - The invention described in the Scheurich patent No 236,845 is one in which the glass is held in position by a mechanism on the back of the glass consisting of a centerpiece that clips at the edges of the glass and backing and a spring rod connecting the center piece with the clip. 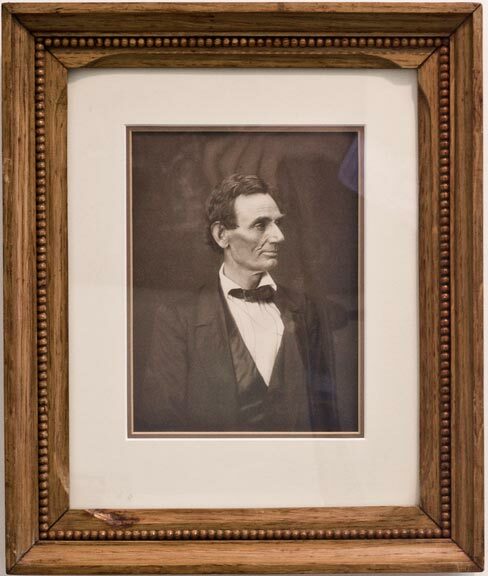 It is 3 1/2 x 8 1/2 inches tall and has a 3 1/8 x 6 3/4 inches pic. size with 2 3/4 x 6 inches visible. 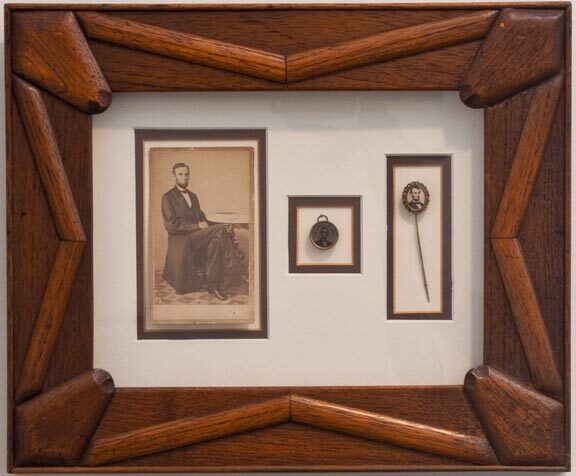 Brass photo frame - G. Scheurich's Patented Photo Stand, Jan.18, 1881 Patent - The invention described in the Scheurich patent No 236,845 is one in which the glass is held in position by a mechanism on the back of the glass consisting of a centerpiece that clips at the edges of the glass and a spring rod connecting the center piece with the clip. Made in the 1880s-1890s. 10 1/2 inches tall. 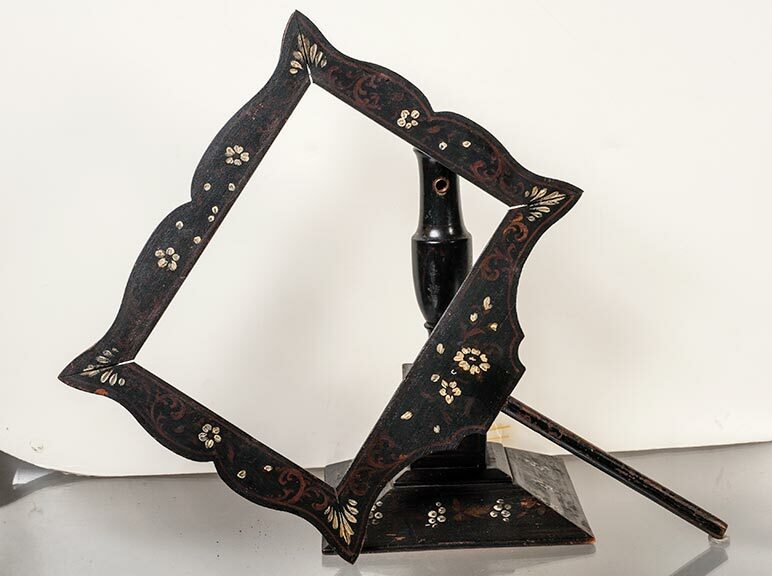 Paint decorated pedestal frame with stand ca.1900. It looks like it might be from a department or clothing store. 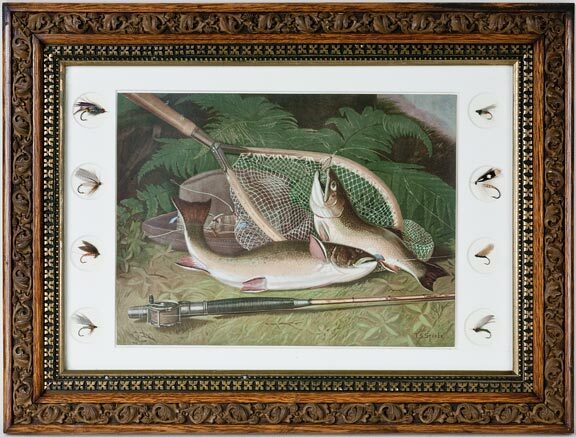 It is 9 1/4 x 16 1/2" and the inside is 5 1/4 x 7 1/4"
Elegant tramp art-style from the 1880s. It is 12 x 16" od. 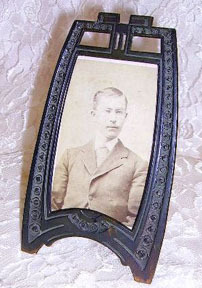 A small, metal Art Nouveau (1890s) metal frame made to hold a CDV photo. Copyright 2016 - 2019 by Stuart Schneider. Do not use any parts of this page without written permission.